The other night I went out to watch Brave with some of my friends. It's a really sweet film, and very heartwarming and tells the story of a daughter and her relationship with her mother. It made me miss my mum. 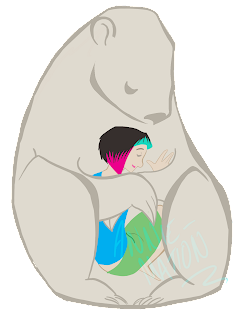 So my mum's favourite bears are polar bears- I currently owe her a drawing of a polar bear that I made at the zoo. After watching Brave I wanted to draw my mum some polar bears, and so I did. This is the first of two, where I took a more stylized, graphic approach. P.S. The polar bear is you.